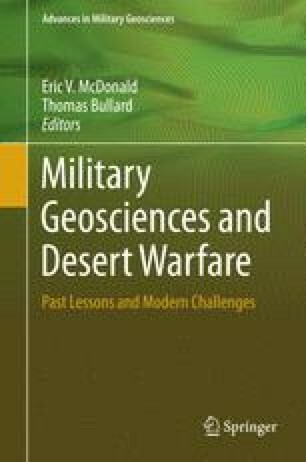 Predicting soil physical and chemical properties for military operations requires knowledge of the geologic and lithologic component of the soil parent material. Geologic maps, a traditional source of geologic information, are often limited in coverage or inadequate for determining the basic characteristics of a soil parent material. We describe an approach for the rapid development of geologic surface maps that identify the lithologic composition of soil parent material generated from ASTER (Advanced Spaceborne Thermal Emission and Reflection Radiometer) data. Generated maps of parent material, in turn, provide key input parameters for a comprehensive terrain predictive model that forecasts key soil and surface cover characteristics in support of military operations. Parent material maps are generated using a multilayer approach where calibrated image data are mapped into lithologic units that best identify soil parent material and corresponding landform units (i.e. bedrock, fan, playa, dune, etc.). A unique and critical aspect of our approach is that expert-based analysis of spectral and geospatial information can produce a geologic map, covering 1000–5000 km2 of terrain, of soil parent material and surface cover in as little time as nine staff-hours. The approach was developed with a guiding principle that terrain predictions in military operations must be rapidly developed for areas where available ground information is limited. Results indicate that it is possible to quickly produce a realistic map of soil parent material using ASTER data without any additional geologic information or data. Results also indicate that analysts developing parent material maps require expert knowledge in both spectral analysis of remotely sensed data and the geologic and geomorphic processes that form desert landforms. Funding for this project is from U.S. Army Research Office (ARO) grants number DAAD19-03-1-0159 and W911NF-09-1-0256. We thank Russell Harmon (ARO) for his help and guidance in the development of this project. Any opinions, findings, and conclusions or recommendations expressed in this material are those of the author(s) and do not necessarily reflect the view of the U.S. Army Research Office. We thank the many scientists at the Desert Research Institute, Hebrew University, the Geological Survey of Israel, and the University of Washington who have partially contributed to this project. In particular this project benefited from discussions and input from Thomas Bullard, Sara Jenkins, Scott Bassett, Rivka Amit, Yehouda Enzel, Onn Crouvi, Yoav Nahmias, Alan Gillespie, and Amit Mushkin. We also thank personnel at the Yuma Proving Ground and the Anza-Borrego State Park for support and access to restricted desert areas for conducting field research. We also thank the two anonymous reviewers whose remarks greatly improved the original manuscript.